On Tuesday January 29, Workspace 365 update 2.69 will change the way you handle and manage your applications in your adaptive workspace with our new app store, which will make it easier, clearer and more easily accessible. We also have a new feature which, especially for larger companies, will make a big change, since they’re now able to use multiple brandings in one workspace environment. Furthermore, work for our Italian customers will become easier with the new Italian workspace. Want to know more? Keep on reading! Do you have ideas for Workspace 365? Vote or submit a feature request! Easily manage your applications from anywhere in the workspace with the app store, which is now permanently available anytime in the home bar. The app store replaces Apps Management in your Settings and now becomes the standard place for admins and owners to enable, disable and edit your existing applications and to add new ones. This enables you to get a clear overview of all your applications and simply adapt your workspace whenever you need to. 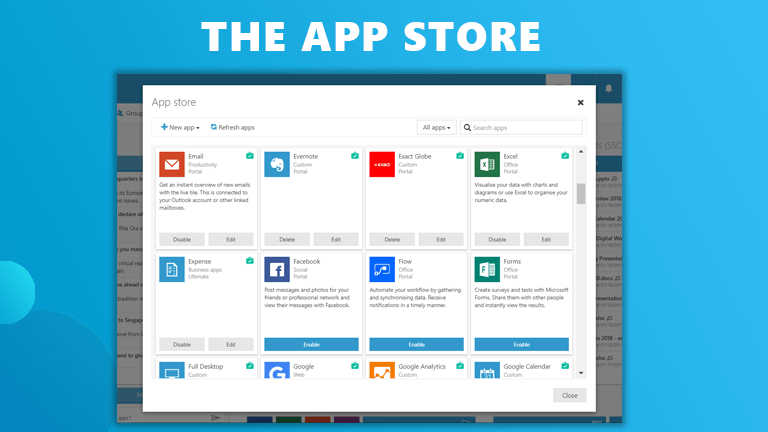 The app store is now also the place where you manage all your app settings, such as permissions, maintenance and Conditional Access. This gives you quick and easy control over your applications and the access to them. With the app store, you’ll have one central and easily accessible location for all things concerning your applications. 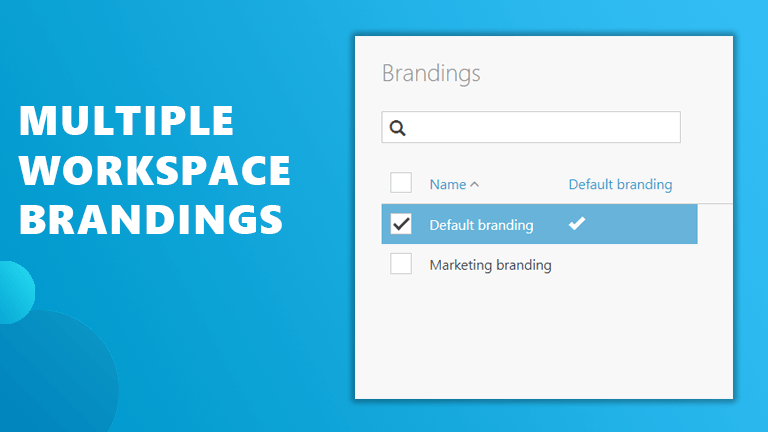 This update gives you the possibility to adapt the workspace’s branding based on user groups. By creating multiple branding sets in one environment, it becomes easy for large enterprises or company groups to roll out a branded workspace for each division or brand from one Workspace. For example, when an educational institution with three different schools use Workspace 365 for all their students and employees, they are now able to set the branding for each school within the same workspace based on the user groups. 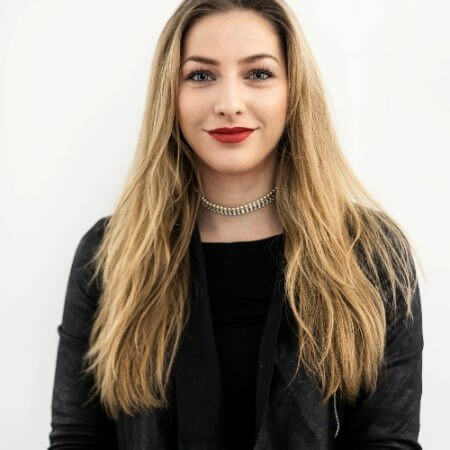 So, by setting up multiple branding sets each school (or company) can quickly adapt their workspace to their brand without hiring expensive consultants, developers or designers while maintaining their application, information and document management centralised in one workspace. Due to our international growth we see more customers in Italy. 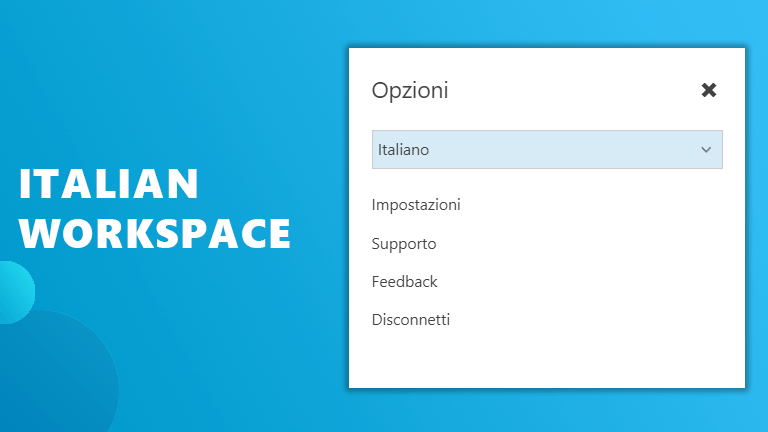 That is why we are very proud to announce that Workspace 365 will now also be available in the Italian language. By doing this we want to simplify work even more for the Italian people who chose for the workspace. We would like to thank our Italian partner Cloudfabric, who introduced Workspace 365 to the Italian market as Persona365. 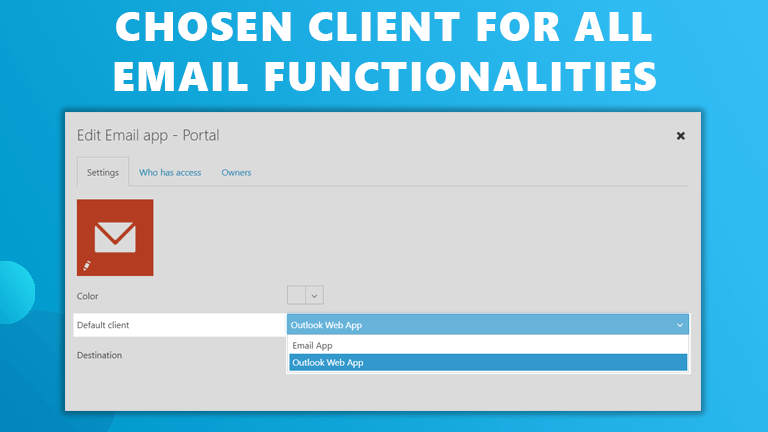 Within Workspace 365 we allow admins to choose between the Outlook Web App and Workspace 365 Email app. From now on, all the actions within Workspace 365 will use this choice. For example, when you use the contact sidebar or plus menu the header. This way, you’ll always open your email with your preferred email client.